The current hybrid V6 era in Formula One has been defined by one thing above all: getting real damn tired of seeing the Mercedes car up front, week after week. Last season was better, but Mercedes unveiled their 2018 W09 EQ Power+ F1 car and I’m already bored of it. As with most of the 2018 cars, the new W09 EQ Power+ is an evolution of the previous year’s car. EQ Power+ has once again been added to the name as it’s how Mercedes wants to brand their performance hybrids in the future. It has a dramatically shorter shark fin and a brand new halo to comply with this year’s slightly tweaked regulations. I’m not impressed with the whole thing and if you give me a chainsaw I would take it off. We need to look after driver safety but what we have implemented is aesthetically not appealing. We need to tackle that and come up with something that looks better. I just bless the rains down in Africa that aesthetics aren’t the primary concern on a safety item! Here are some up-close shots of some key details on the car, taken by one of the attendees at the car’s first public laps today at Silverstone. Overall, it has a slightly increased rake, different packaging for the power unit, and a host of technical improvements that the team hopes will make it more reliable than last year’s car. It also has the new M09 EQ Power+ power unit. Mercedes already had F1's most reliable engine of the current formula, but that has been upgraded further to meet F1's extremely worrisome new rules that only allow teams three power units per season instead of last year’s already too-few four. Mercedes’ traditional racing color—silver, as they’re Silver Arrows—is even the color I’m tired of seeing on road cars, and their livery preview shows that won’t be changing anytime soon. I’m into the sort of retrowave, stylized neon-style lines in any other context, but here, I just want it to finish behind the other cars more often. It’s nothing personal. Mercedes earned that string of wins with absurd German precision. It’s just that I, a normal human fan, have trouble identifying with (and consequently, rooting for) perfection. I want my teams to sometimes flop like I do. 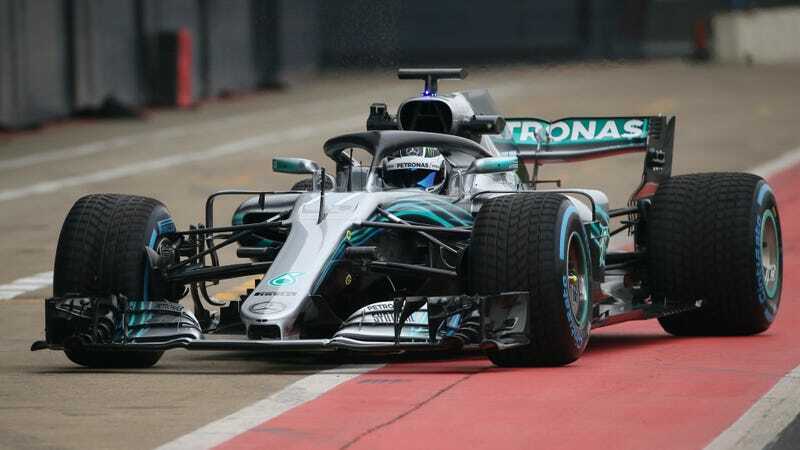 Four-time world champion Lewis Hamilton and up-and-coming fast Finn Valtteri Bottas will return to drive this car, and hopefully, battle more than each other in it. They both seem like good dudes! I just want to see them put up more of a fight this year for the title. Is that too much to ask?